Ministry of Intrigue – Saddle Up! We’re on our way to the Ninth World. This July, I’ll be running my first convention game of an RPG at GeeklyCon. I’ve been a DM for many years, but my focus has been running long term campaigns for my friends. I recently wrapped up a 5+ year 4E campaign, and we kicked off our replacement 5E campaign this last weekend. Running a one-shot adventure for a bunch of strangers is new experience for me, and even though the thought of it makes me anxious, I want to give it a shot. 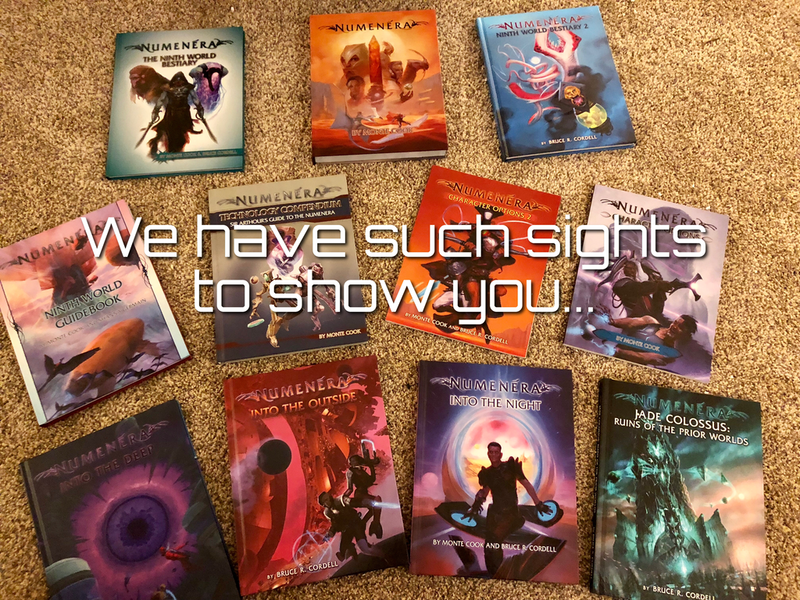 I quickly settled on Numenera for the game to run. It’s one of my favorite game settings, I enjoy the mechanics, and it provides a nice break from D&D. I’ve written about the game before, so check that out if you’re curious what makes it so distinguished from other systems. If you haven’t looked at the game yet, well, you need to run out to your local game shop and pick up a copy. Now, prepping for a con game is totally different than prepping for a campaign. I’ll have at best three hours to get through the whole adventure, and I cannot assume the players will have familiarity with the game prior to starting. That means: pre-generated characters, cheat sheets, and a tight tutorial at the beginning of the session. That means there won’t be time for dead air, and it requires a tight story that doesn’t depend on multiple sessions to resolve. I’ve been reading up on a lot of the common mistakes that GMs make when running their first con game, and reading about them both excites and terrifies me. And hey, anything that makes me feel that way, is probably worth sharing with all my fellow GMs out there. Over the next few months, I’ll be occasionally putting up posts about my preparation process here. For those of you going on this journey with me, I’ll warn you that I’ll likely be sparse on adventure details until after the convention. No point in potentially spoiling the story for the players! I’m hoping that by sharing what I learn along the way, it’ll help more GMs like myself build up the confidence to volunteer to run a session at their next convention.